The best cheddar in Scotland - aged to perfection on the Isle of Mull. 17.6 ounces per wedge, crumbly and sharp. This aged farmhouse cheddar is made each day from the fresh milk at the only dairy on the Isle of Mull. Chris and Jeff Reade have perfected cheddar by aging it at just the right temperature and turning gently every week for months. 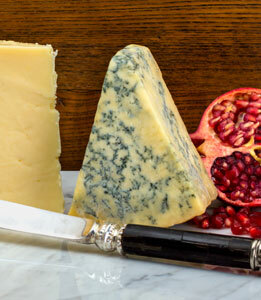 You'll enjoy the rich flavor as this unpressed cheese almost melts in your mouth. Another one of the 1000 foods to eat before you die, according to Mimi Sheraton. Made from unpasteurized cow's milk. 500 gram wedge weighs in at 1.1 lbs or 17.6 ounces. Chris & Jeff Reade, and now their sons, make cheese twice a day at the only dairy on the Isle of Mull, Sgriob-ruadh Farm. The cows are milked three times a day to yield extra milk and the milk moves literally feet to the cheese making tables. Jeff believes the less the milk is handled, the better the cheese. Nearly all of the cheese made begins as cheddar, which ages wrapped in cheesecloth on long wooden shelves in the cellar below the cheesemaking floor. Each 50 lb wheel is turned each week for months, and when Jeff thinks the cheese is worthy of a taste, he tests just one wheel of the batch. If it doesn't taste 'right' off the shelves it goes and it is grated and mixed with herbs or garlic or some other strong flavor and pressed into rounds. 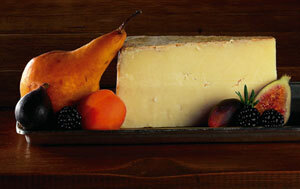 Only the best cheese continues the long, slow process of aging to become Tobermory Cheddar. Isle of Mull Farmhouse Cheese Wedge - 8.8 oz. 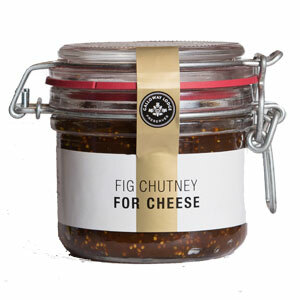 This is without question, one of the finest cheddars I have tasted and I am a cheese nut. Had the best breakfast in years. The Back Bacon was superb. So far I have tried the meat pies and the bacon and can't wait to try the bangers and Black Pudding for another breakfast. Will definitely be ordering again. Owner Response: OOPS - We sent you the missing cheese today. Enjoy! After coming home from a trip to Scotland, I was craving the Isle of Mull Cheddar. On several occasions during my trip, I had sandwiches with the pickled spread and this cheese--absolutely delicious! My local cheese counters only carry it during the holidays, so I was thrilled to find it on this website. It arrived, neatly and efficiently packaged, and is currently making regular appearances at meal time in my house. Couldn't be happier!